By Farelive (Italy)*: #C.I.P. – Counter Irish Project. Irish folk and traditional songs specially arranged by Riccardo Angelo Strano and the guitar player Davide Sciacca. *Online releasing in 2018 (the digital version already available on i-tunes). *Physical Cds’ releasing in January/February 2019 (date to be scheduled). 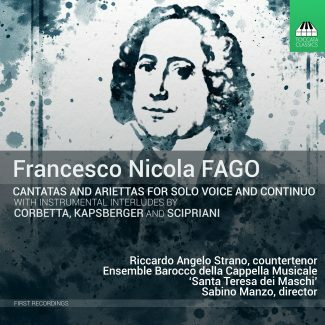 World discographic première of cantatas and arias for solo voice and continuo by Francesco Nicola Fago (1677-1745), known as “Il Tarantino”, for the discographic label Toccata Classics (London), with the “Cappella Musicale Santa Teresa dei Maschi” ensemble (Bari – Italy).